The Traditional Latin Mass is the Mass of the Roman Catholic Church as codified by Pope St. Pius V shortly after the Council of Trent (1545-1563). 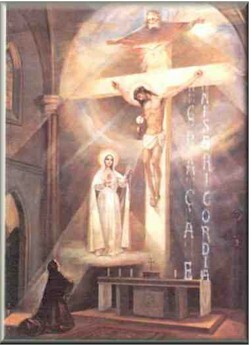 It is often called the Tridentine Mass in reference to the council. Pope St. Pius V did not issue a new Mass but simply unified the already existing liturgy. Pope Benedict, in his recent Motu Proprio, referred to the Traditional Latin Mass as "the Extraordinary Form of the Roman Rite." The use of Latin in the offering of the Mass dates back to the second century when the fathers of the Church gathered elements formerly in Hebrew and Greek into a common missal. A common language is source of unity - With the spread of the Church into different cultures using different languages, a common language for the Catholic liturgy provided a common connection between Catholics. This universality allowed any Catholic to walk into any church in any country and assist in the same sacrifice offered in a familiar language. Not only does this provide a geographic connection, but a temporal one as well. One can be assured he is hearing the same prayers and sacramental formulas that touched the ears of thousands of saints throughout the history of the Church. Latin is a dead language - Far from being a detriment, the use of a language not part of a particular vernacular serves two very important functions. First, because the language is not being used, it is not developing. Unlike English or Spanish, Latin words cannot take on different meanings over time or across different cultures. This ensures the doctrinal truth and accuracy of the liturgical elements. The second advantage is by using an ancient language not commonly heard, the faithful are provided with an enhanced sense of the sacred. Young and old alike know when they're attending a Mass held in Latin, it is not a commonplace experience and is quite accurately, not of this world. "To all those Catholic faithful who feel attached to some previous liturgical and disciplinary forms of the Latin tradition, I wish to manifest my will to facilitate their ecclesial communion by means of the necessary measures to guarantee respect for their rightful aspirations. In this matter I ask support of the Bishops and of all those engaged in the pastoral ministry in the Church.